Amid school closings and escalating tuition costs, these schools remain committed to high-quality Catholic education. In the aftermath of the closing of 48 schools in the Archdiocese of Philadelphia, and in light of the dramatic decline in Catholic school enrollment in the United States over the past half century, in January CWR profiled five Catholic schools that were thriving despite a troubled economy, smaller family sizes, and a secular culture increasing hostile to traditional religion. The following is a continuation of that series, highlighting five other thriving Catholic schools. CWR spoke to the schools’ teachers and administrators, who shared their insights into how their schools have been successful during this difficult period in Catholic education. Marin Catholic High School (www.marincatholic.org) in Kentfield, California is one of four high schools of the Archdiocese of San Francisco. It is nearly at full capacity, serving 720 students grades 9-12. Its 70 teachers include three Dominican Sisters of Mother Mary of the Eucharist, a flourishing order based out of Ann Arbor, Michigan whose sisters wear the traditional full habit. Marin Catholic also recently welcomed Msgr. Robert Sheeran, who is serving as a chaplain; Msgr. Sheeran was previously president of Seton Hall University in New Jersey. The cost per year to attend tops $16,000, although 29 percent of the student body currently receives tuition assistance. The school is on a solid financial footing despite receiving no funding from the archdiocese, but is always in search of donors to help students with financial aid. The 13.7-acre campus is located in an attractive Northern California setting, at the foot of the mountains. Special features include the beautiful St. Francis Chapel, built in 2003, in which students, staff, and friends of the school attend Mass on weekdays at 7:30 am. Marin Catholic outscores neighboring public high schools academically, and boasts small class sizes of 21 students (nearby public schools have up to 35 per class). Many students go on to top colleges. The school was founded in 1949, and has fought to maintain its Catholic identity, despite its close proximity to secular San Francisco. Two of its former presidents have become bishops; Navone is the first layman to assume the role. St. Michael the Archangel Academy (www.smacademy.com), an Irvine, California-based homeschooling organization, is celebrating the 20th anniversary of its founding this year. It serves 116 children grades K-12. Most students live in Southern California, but some live as far away as Italy and Chile. Marcia Neill serves as director of SMAA; she founded it to educate her own four children. “I wanted my children to have a traditional Catholic education but we could no longer afford to put them in Catholic schools,” she explained. Her children are grown now—three are married (to other former homeschoolers) and one is nun—but Neill continues to operate the SMAA, together with the school’s Board of Directors. The school has not been formally approved by the Diocese of Orange, in which it is located; however, priests working in the diocese assist the school. The cost of the program is $1,500/year, for which parents receive a curriculum tailored to the learning styles of their children. This particularly benefits children who with significant disabilities, such as autism. Although children do much of their learning at home, they do gather for special classes and events, including school dances and field trips. Families are also encouraged to be active in their parishes. SMAA is loyal to Church teaching; in fact, board members are required to take an oath of fidelity to the Magisterium. Neill has met critics of homeschooling over the past two decades, including parish priests, but is gratified to have won at least some over. “They see the end product—our kids—and they are convinced,” she said. While many schools of the Archdiocese of Philadelphia are closing, others are doing well with strong enrollment. Among these is Our Lady of Good Counsel School in Southampton, a suburb of Philadelphia. The parish school serves 413 students in grades pre-K through 8th; enrollment costs about $3,225 annually per student. The actual cost to educate a student there is about $1,000 more; the remainder is made up through parish subsidies and fundraisers. He also noted that the school’s children consistently score above national averages in academics. The Philadelphia school closings are not the dire news that the national media suggests, he believes, but the reality of changing demographics in the inner city. Many Catholic educators in the archdiocese anticipated the closings. “Younger families with children are shifting to the suburbs, and many who remain are older with grown children, non-Catholic or Catholic but not practicing,” he explained. Mokriski also observed that the mindset of many Catholic parents has changed since he began teaching in the archdiocese 37 years ago. “It used to be that if you were Catholic you’d send your children to Catholic schools; that’s no longer true today,” he said. He’s also observed that some parents in the parish schools are poorly catechized, and have little understanding of Church teaching and the importance of the sacramental life. It’s been the challenge of parish priests to improve that, he said. One of the greatest challenges for Catholic families who want a Catholic education for their children is the cost of tuition. With an annual tab of between $3,000 and $7,000 per year per child at the elementary level, and more than twice that for a Catholic high school, many cannot afford a Catholic education, even with tuition assistance. In the Diocese of Lincoln, Nebraska, however, parish schools have tuitions that are nominal; hence, just about any parent who wants to send his child to a Catholic school can afford to do so. 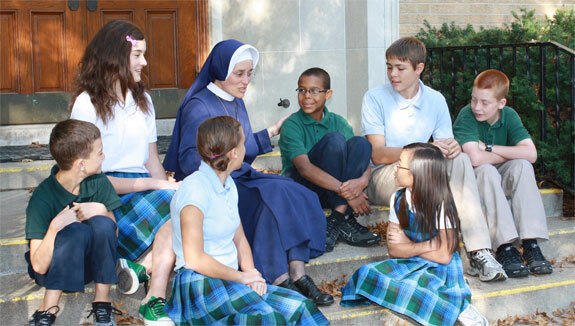 Sr. Mary Cecilia estimated that of the parish’s $1.2 million budget, $900,000 is devoted to Catholic education. The funds not only support the elementary school, but students going on to the local Catholic high school as well. St. Theresa is staffed by 20 teachers; the principal and two of the teachers are School Sisters of Christ the King. The sisters are a diocesan community founded in 1976; their community of 29 works in seven of the diocese’s 40 schools. St. Theresa was founded in the 1930s; its first teachers were Dominican sisters. Msgr. Joseph Nemec has served as the parish’s pastor since 1993, and has not raised tuition at the parish school since arriving. The diocese is led by Bishop Fabian Bruskewitz, well-known for his orthodoxy, who tells the staff members of his Catholic schools that Catholic education is more than just academics, but teaching students the Catholic faith, says Sister Mary Cecilia. St. Michael’s Abbey Preparatory School (www.stmichaelsprep.org) in Silverado, California is celebrating its 50th anniversary this year. It is a Catholic boarding school for boys grades 9-12. It serves a maximum of 64 boys; about half of their teachers are Norbertines of St. Michael’s Abbey. The school’s annual cost is $20,000. Boys typically live at the Abbey five days per week, and go home to their families on weekends. The school’s courses are accredited, and it has approval from the diocesan bishop. Many boys are familiarized with the school through the Abbey’s summer program, which is for boys ages 7-12. St. Michael’s Abbey was founded in 1961. Its first members were priests from Hungary escaping from communism who made their way to Southern California. The boarding school was initially founded as a minor seminary and later became a college preparatory program. Some graduates of St. Michael’s return to become members of the Norbertine community. The size of the school is limited by the facilities available on the 34-acre hillside Abbey site. The Abbey is looking to re-locate to a larger property in the future, which will enable the prep school to expand.